Remember the 90s? I like to call that era the “days of dial up.” Most people who had Internet access at home subscribed to a slow dial-up ISP (like AOL). Those were the dark days. We tweaked Windows trying to maximize everything we could just to squeeze 5 megabyte files through a 28.8 kbps Internet connection. Talk about almost a 30 minute wait per file! Now, practically everybody has access to some form of broadband at work, school, home, or a public venue. In fact, you can even obtain “free” Wifi access from the neighbor across the street if you wanted! Generally, we don’t really care about maximizing bandwidth these days. 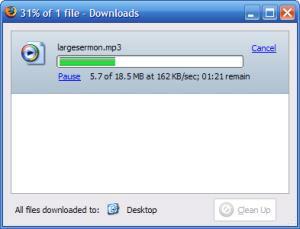 It takes less than a minute to download that 5 megabyte file! It’s only when we download a 4 gigabyte ISO file that we start caring about getting the best speed possible. This is when I start to question what my ISP advertises. They promise that I get a 6 mbps speed. Why is it that my Linux ISO file downloads at 300 kb/sec (2.4 mbps)? Somewhere along the way from my computer to the server, I’m getting shorted. I know the source of the problem is not my ISP because when I torrent files (legally!) I get higher speeds. Then where is the problem? It can only be the website server. There are two important things that the server allots for each client. 1) It specifies the maximum number of simultaneous connections and 2) it also specifies the maximum speed for each of those connections. So, how can we exploit the server with those two values? Increase the number of connections. Pretend that a server only allows 5 maximum connections at the same time each of them with 300 kb/sec. If you download a file normally, the file will transfer at only 300 kb/sec. On the other hand, if you download 5 different portions of a file at the same time, the file transfers at 1.5 mb/sec. That’s a huge jump! And that’s exactly what I did with DownThemAll! This simple and ingenious Firefox extension is a pauseable download manager that downloads files in up to 9 connections maximizing bandwidth! When I use this, the maximum speed I’ve achieved was 900 kb/sec (7.2 mbps). It turns out that my ISP wasn’t lying after all. It was actually underpromising! This concept of multipart downloading is not very new. People from the “days of dial-up” might remember Download Accelerator. That was Web 1.0. We’re now in Web 2.0. What makes this program better is the fact that it’s free, open-source, spyware-free, ad-free, and restriction-free. Download Accelerator was closed-source, full of spyware, laden with advertisements, and was full of restrictions if you didn’t buy the pro version. Plus, how cool is it that your download manager is integrated with your browser? See what speeds you can achieve when you download them all with DownThemAll! This entry was posted on Friday, January 26th, 2007 at 2:59 pm	and is filed under Extensions/Plugins, Internet, Utilities. You can follow any responses to this entry through the RSS 2.0 feed. You can leave a response, or trackback from your own site. Sorry there is nothing. Internet explorer does not have an open extension policy. I suggest you switch to firefox or a browser (like chrome) that has the possibility of having a similar function. 2010 Need for Speed: Hot Pursuit titre dans la franchise Need for Speed avec des voitures exotiques et de la police poursuites à haute vitesse. de chaque côté de la loi offrant son propre ensemble de défis, les risques et les récompenses. Rivals mettra en vedette onze gadgets évolutifs tels que les PGE, ondes de choc et la possibilité de faire appel à des barrages routiers. à un besoin de 2012 for Speed: Most Wanted, avec plusieurs sauts, des pièges de vitesse et les voitures à débloquer. could devote hundreds of several hours on end making an attempt to defeat it this is why Sweet Crush Saga Reside Resource three.8.5 was produced!